Kopria This remote little beach is 45 km southwest of the city of Rhodes, on your way to the castle of Kritinia. Surmounted by the ruins of the Feraklos fortress, the village of Haraki (or Charaki, 8 km south of Archangelos) extends around a semicircular bay. There are no large hotels here, individual holidaymakers predominate. Here you fill find several small guesthouses without a separating road directly on the pebble beach. 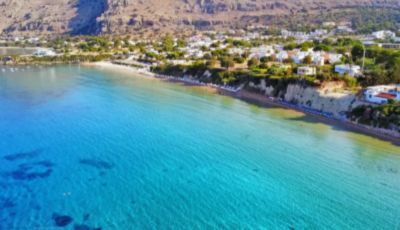 The sight of children searching for shells among the pebbles, couples gazing out to sea from the balconies of their rented rooms, sun-burned mothers wheeling push-chairs up and down - this attractive little bay definetly offers a family atmosphere. Along the promenade directly in front of the beach you will find mini-markets, restaurants, cafes, and a foreign press agency. Many of the cafes and restaurants also offer breakfast. In Byzantine times, in 1306 to be more specific, the fortress overlooking the bay of Haraki was conquered by the Knights of St. John. In 1470 Grand Master Giovanni Battista degli Orsini had the fortress modernised. The castle was mainly used as a prison for prisoners of war and as a place of exile for Knights who had been found guilty of something. In addition, it protected the numerous sugar cane plantations, whose harvests were processed in a sugar refinery immediately below the castle. Archaeologists have uncovered minor traces of it. Today there is little left of the fortress. 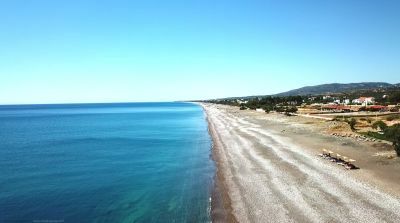 From the north side of the hill there is a beautiful view over the fertile land around Malona and Massari, the beach of Kalathos, as well as over the beach of Agathi, and of course Haraki bay at its feet. I came to Haraki for the first time in June 2006 for 2 weeks holiday. and on the fourth day, I bought a house, as one does! I'm celebrating 10 years of living life in colour this August. Why not book a cheap flight and have a bit of it for yourself !?! Hey, and while you're experiencing the REAL Greece, treat yourself to a copy of the Daily Mail, find a comfy beach front bar, and laugh yourself silly at the DM's anti-Greek propaganda, while you enjoy an enormous Gordon's and tonic (3 to 4 euro) an industrial sized glass of wine (2 euro) a pint of premium ice cold lager (2 euro) or a splendiferous cocktail (from 3 euro). Hungry ? Take you pick from around a dozen friendly family run tavernas on and around the pedestrian-only promenade, serving fresh local produce. A substantial meal for two with drinks on the beach front can be had for under 20 euros. A full English breakfast will set you back as little as 4 euro including tea, coffee or juice. Still smoking ? Even better. Bring your credit card and take up to 3200 English branded cigarettes each back with you (4 euro / Â£3.25 for 20). Result....? A week\'s \"free\" holiday. If you can stomach the Greek brands, you might even save enough to cover a fortnight. So get on the interweb quick sharp and book your flights and accommodation, and we\'ll see you in Haraki Bay soon ! I first went to Haraki in 2005 after my wife went with her friend in 2004 and she kept telling me how beautiful a place it was and how wonderful and friendly the people were..I did not believe her at first but I tried it anyway,.. Cut a long story short we have been going back every year and the rest is history... Going back on sept 2nd , just a few very short days away. Haraki is now a home from home for us and we can't wait to go back for what will be our 8'th time. each time we go back we see the same faces cos everyone loves it soooo much! After visiting Haraki for the first time i went to Marias taverna on the first night and the food was that good that I went there every night for the duration of my 2 week stay. The huge menu feel of delicious traditional Greek dishes made my choice to dine so easy. After a long day on the pebbled beach i would often look forward to having moussaka watching the sunset in a prime location on the sea front. 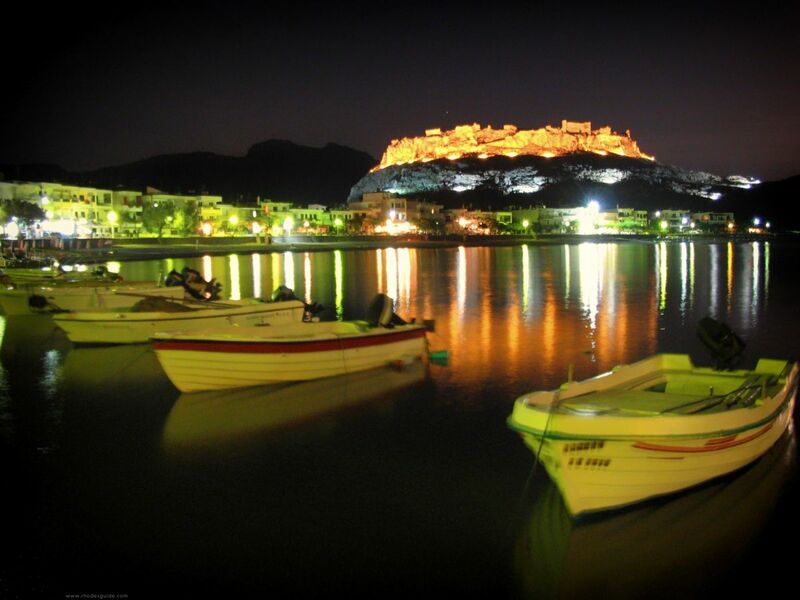 Haraki is Rhodes's best kept secret !! Shhhhh! We don't want too many people to know about this beautiful little quiet place, where the people are lovely, and life just oozes past you as you lie and relax, wade into the sea and watch the fish nibble your toes, or sit gazing out to sea with a glass of wine or beer. I'm in heaven, so in heaven, every time I see this place!!!! It's all been said so just my own take on the heaven that is Haraki. Beautiful place, beautiful people. We've been going for 8 years now and will be there in 3 weeks time. Can't wait! Looking forward to seeing our great friends and great hosts Despina, Vasili, Savas and Mikaili at Bottom's up! Despina, get 2 large Alfa ready, here we come! we arrived late evening / early morn and went straight to bed, when we got up in the morm we thought we had died and gone to heaven, absolute paradise so much so that we have been back every year since and love this place and people soooo much we bought our retirement home and are moving out there this year. Cannot compliment the people enough for the welcome and reception that you get wherever you go in the bay of Haraki 10/10 EXCELLENT!!!!!!!!!!!!!!! 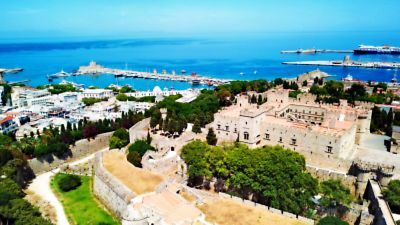 We have visited quite a few places in Greece over the last few years but last year we went to Pefkos and it is not normally our intention to go back to a place but we like Rhodes so much that we decided to return. So we spotted this place Charaki and booked two weeks at Alia 2 apartments. Just returned 23.6.10. Just fell for the place - Debbie, Billy and son Sam at Bottoms Up, Maria and Husband at Sunrise, Paradiso for superb food, the lads at a Haraki Bay Hotel. Could go on. Real, real friendly people. What a brillant chill out place. And the fantastic Golden Sands Beach over the hill. Need to go back again soon. My wife is from Rhodes and we were there in July '09 so decided on a day trip to the beach at Haraki. That day trip lasted four days. What a beautiful bay, beautiful people and such a relaxed and quiet atmosphere. Bravo Haraki, we are coming back to our little gem. Charaki is a delight for all ages. It is one of those Greek gems we all knew many years ago and thought had disappeared under the tide of commercialism. It has a charm of its own, the people are extremely friendly, Maria at M & S car hire has a special charm of her own, so welcoming and helpful. Paradisos taverna is fantastic and serves the best home made chicken nuggets for children anywhere in the world and excellent adult food too. Alia 1 studios are inexpensive with a pool and are highly recommended, fantastic location, lovely people, comfortable studios (with hairdryer) - air condition units available, quite expensive but very necessary in the summer heat. This gorgeous little village has a part time tourist exchange office - no ATM but there are some at the banks in nearby Archangelos. Bus service to Rhodes and Lindos from the main square, good swimming, good snorkelling - super beach some brollies and sunbeds available but not necessary to use them. Highly recommended. Heaven was truly found beneath the white clouds of Haraki. We will be there again 2009, so peaceful and serene. lovelly place to chill, had a great time, esp in jacks bar! Just back from heaven on earth again!!! nothing ever changes we have breakfast at bottoms up you can get anything you want (french toast) just ask for anything, and cos you eat there in the morning you get sun beds free, most nights we spent at jacobs(cocktails and dreams)cant wait to go back! Been going to Haraki since 1990 - it's changed but is still a quiet peaceful seaside village with plain and simple accommodation. Restaurants and bars are all good, all worth visiting - caters for all tastes. Beach is safe and has pebbles at one end, sand at the other - unfortunately the ducks were not there last year. Going again in September and can't wait - as has already been said on here - Heaven on Earth. What can you say amazing place amazing people. Lost count of how many times we have been but it is not enough. We will be there all of june 2007. Hope to see you in heaven on earth. Haraki is a beautiful place with the most stunning views + has such a friendly atmosphere you will want to come again and again. We were there for our friends wedding in June 2006. The reception was at Jacks bar, as we all know and come from the same village as Paula, Jacks wife. The place blew us away, so much, that we are going back in June this year! I have holidayed in Haraki 4 times now and love the place so much I am going back!!! Heaven on earth. So peaceful and wounderful. This is why the Gods chose Greece as their home! If there's a paradise on earth then this is it. A wonderful place to laze, laze and more laze till it's time to eat at one of the wonderful restaurants. Then have a few drinks and laughs at Jack's bar. My 4th year of going there and it won't be the last. As from this summer 2007. Jack's Bar & Haraki Heaven next door have merged into one and is now called Jack's Heaven. I'm seeing Jack on Sat March 9th so I'll write more then. We have been going to Haraki since 1996. This year will be our 7th trip. It is the most relaxing place in the whole wide world. Looking forward to a wet lunch and tuna toasties at Jack's Bar. Have had some of our bestest holidays here. Will be there in June 07. Never a bad word about this place, go there enjoy it but please don't ever abuse it. good luck in the future. Have been to Haraki 2005 and 2006 and can honestly say they have been the most relaxing holidays we have ever had. The food is great- especially Costas and Helenas and Haraki Bay Hotel. It is especially beautiful because it is so unspoilt and the locals are all so friendly and helpful. Hope to return and live there when my daughter finishes school. We had a wonderful 10 days holiday in Haraki made all the more wonderful by Debbie of Bottomsup snack bar, We hope to return there next year. Last month, in july, we've spent our holidays in Haraki. Haraki is a great place with lovely beaches and very nice people. We used to go at cocktails and dreams bar. the accomondation was perfect. In the evenings people there are so friendly... we met jacob, the owner, george and vasilia (jacob's son and daughter)... george makes lovely cocktails and plays vey good music!We are hopefuly going again next year in Haraki, we realy enjoyed our holidays this year. We would recommend everyone to go on holidays in haraki! Definitely going back!!! Jack's bar is the best. If you haven't experience Jack's singing you have missed a treat, he has the voice of an angel, tee hee. You must try one of his ice creams, but get there before the locals. Miss them all already and have only been back a couple of weeks. Costa and Elena's is the place to eat and the Italian is great. There is absolutely no need to travel around if you want the most relaxing holiday of your life! We hope to be going back in October for only 1 week (unfortunately) but looking forward to it soooooo much. We have been in haraki a few days ago. The place is lovely! Nice beach lovely people! Have just come back from my second stay in haraki and it is just heaven on earth. Will be going back in September sadly just for one week. Can't wait to go back! In June 2006 it will be our 7th time in Haraki,we will meet again with Mike,Athena, Costa and Elena and their families at Cocktails and Dreams. Where we will be treated as old friends. Haraki is a place you don't want to leave and can't wait to get back to. Our piece of paradise. First went 2 years ago. Going again this year (3rd time). Meet fun people every time. Athena is beautiful and she, Costas and Mike make it 2 weeks to remember and treasure. Anyone going at the end of July,1st week in August, we'll see you there! If europe has a place of paradise, this is it. Laid back attitude by the locals who are very friendly. Wonderful weather and all day to do nothing in. I went for 2 weeks last august. I'm goin' back this august to Jack's bar. Lovely place run by Jack the Greek and his lovely scottish wife Paula. It was our first holiday abroard we were made welcome the day we woke up and went to jacks bar. from that day on he seemed to become an addiction for us. We would start with a big english breakfast and then always end up there of a night. meeting up with the regular holiday makers and also the greek residents who worked there. We became good friends with savas and fedra. Savas(sam) worked at jacks bar and they even took us out and showed us what greek dancing was all about. We hold fond memories of jack chewiing on his straw as he tells you to take a seat and what ever drink you wished for you got. No problem! We hope to go back soon and introduce them to our new baby son & our 3 girls. The island of Simi is a great day out roasting hot on the ship great excursion. And also the island of butterflies. there is a suppurb beach about 15 minuites walk from the cove. Its nice & quiet but you r only 20 to 25 mins from lindos & falaraki best place to recover from your hangover. Went to Haraki in July 05 could not wait to go back in Oct. 05. Going again 2006. People so friendly - Stefano, Jacob, George, Costas & Elena, Nina. Nothing to do and all day to do it in, who could ask for a more relaxing holiday in a beautiful little bay. We fell in love with place 2 years ago. We went this year in July, came home and booked another week in October. Mike and Athena in Haraki Dreams are the best bar with Costas working there to. Costas and Elena shop for gifts to take home is the great. Eat at Dina and Manolis taverna (the first taverna on the way out of Haraki) for the best BBQ and oven dishes. We have many friends out in Haraki and will return to live when my son has finished his education. This is really getting away from it all, great food very friendly tavernas & cocktail bars. Its starting to get a bit pricey to go there, so last year we took a last minute deal to Faliraki, after a couple of days got the bus down to Haraki rented a room and stayed for six nights. It really is getting away from it all.The new italian restaurant is lovely. Haraki is the kind of place that you can only dream about, Photos do not do this quiet resort justice. I keep going back every once in a while and even after a gap of four years some of the locals remembered me. Its ideally situated and very laid back most of the accomadation is in the village on the sea front but some is a bit further back which can lead to an interesting walk back home after a night in the taverna or cocktail bar (say Hi to mike if you go Coctails and dreams). The other bars are all equally as good. If you like fish the Argo is out of this world for food and atmosphere but I have never had a bad meal in haraki, or charaki, or xaraki, call it as you wish. The beach in the village is mainly pebble and shingle and shelves to deep quite quickly but the ducks (yes sea ducks seem to like it). If you want sand and shallow a short walk to the next bay gives you the unspoilt Agathi beach, if a certain lager company did beaches this would be it. Its a quiet place but not far from Lindos (good night out). 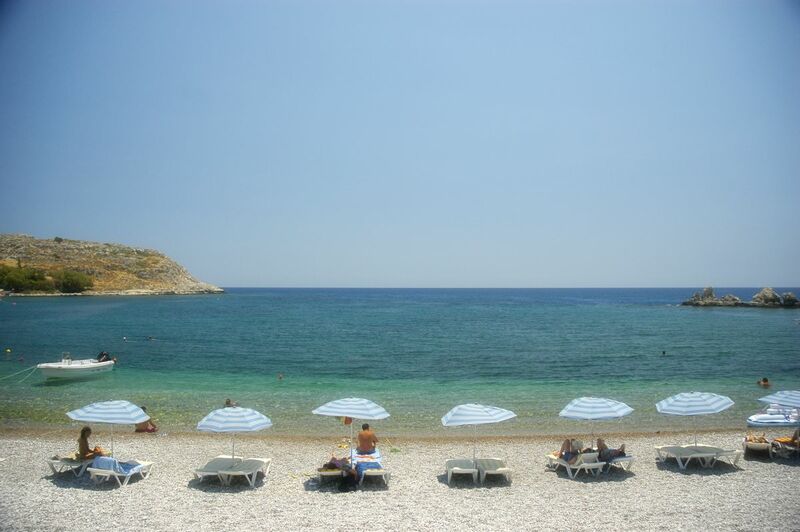 As a relatively low profile beach resort area, Pefki (Pefkos) is made up of smaller hotels and rooms to let. The pines stand tall above the buildings, as you look back towards the shore from any of the chair of sandy coves.